Brookman Solicitors conducted a relationship survey which revealed some of the key challenges faced by family businesses and identify 4 key ways to achieve working harmony. The competitive 21st century business environment brings with it an immense pressure to succeed and do well which can naturally strain working relationships, disrupt day-to-day tasks and constrain employee morale. This can be detrimental for even the largest of teams with selectively chosen boards of executives and CEOs, so the impact for family businesses can be even more noticable. Embarking on a family business can cause conflict, uncertainty and stress so it is important to be prepared and plan the working dynamics accordingly. This will help to maintain a positive family-work-life balance whilst also maximising business productivity. So just what are the issues that you can expect to face in a family working environment? The recent survey revealed that a failure in communication was one of the most significant annoying habits for family businesses. 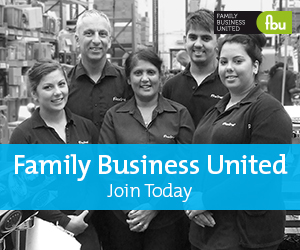 Family businesses are not alone - so many businesses make mistakes when it comes to effective communication and teams often avoid difficult conversations, hide behind emails, avoid assertiveness and take a ‘one size fits all’ approach to communicating at work. This can ultimately lead to a lack of transparency between co-workers, incomplete tasks and potentially even conflict. Effective communication can help reduce conflict by creating an open and accepting environment that promotes listening and resolution rather than negativity and defensiveness. So just how can this be achieved? Family businesses should make sure that regular team meetings are scheduled within working hours. This creates a designated time period for everyone to voice their opinions and concerns without edging into personal/family time outside of work hours and interfering with family life. It is crucial to recognise that businesses are made up of many different people with different ideas, different thoughts and diverse agendas. In many companies, this can see managers and departments working independently rather than collectively, which can reduce business productivity. This is the same for family businesses, who may be responsible for different aspects of work that perhaps clash in terms of goals and resources. It is therefore important to be mindful of each others goals in order to reach mutual decisions that play to the strengths of the business. This means taking a more holistic approach to business management that incorporates the views of other family members and avoids pushy or dictative behaviours that could lead to conflict. Compromise avoids the build up of unessarary tensions and helps achieve business harmony by demonstrating that everyone is equally important. In many cases managing money is a prominent issue faced by family businesses. This can ultimately put strain on family members, leading to confused finances and workplace conflict. It is therefore important to play to individual strengths in order to progress the business and boost confidence in each others abilities. Delegating financial roles to those family members with an aptitude for accounts might be a smart move and could save thousands in accountancy costs as well as avoiding problems with sharing financial responsibilities and confusion. Equally, if a family member is particularly socially inclined, giving them a customer facing role could be a great choice. The main benefit of a family business is how well you know each other, you know instantly which member involved has which strengths and can play on this to your advantage. If a member is not pulling their weight or are pushing their luck in the business you cannot turn a blind eye just because they are 'family.' When that individual becomes aware that they can take advantage with no repercussions for their behaviour due to the family connection, their dedication to the business and their role will decrease substantially which could negatively impact the business. This will put added pressure on others in the business who have to pick up the slack as well as demotivate other employees not related to the family who see a case of preferential treatment, further decreasing the business’s productivity.This is a key way to ignite conflict and must be dealt with before it becomes a bigger problem. Speaking to the family member concerned should be the first step towards resolution rather than going straight into disciplinary action. They may feel they need more training to complete their role more effectively and this should be considered by other family members. About the Author - Brookman is a highly regarded specialist divorce and family law firm that advises clients in the UK and internationally. Brookman is ranked by the Legal 500 and has been awarded the Law Society’s quality mark, Lexcel. For more information visit www.brookman.co.uk. The online survey was conducted with 1006 married individuals, based in the US, during April 2018. The couples were asked 10 questions relating to their marriage, relationship challenges, solutions and the role that media, technology and social media plays in relationship breakdown.